Yaakov Neeman | Zimmerman Editions, Ltd.
Ya’akov Ne’eman was born in Transylvania in 1908; from his mother’s side he is a descendent of the famous Panett rabbinical family. As a young man he went to the yeshiva, spoke Hebrew and studied artistic jewelry. He always loved to create and he drew some ink drawings. The family has only one of his handmade Mizrach wall hangings. This wonderful black and white drawing, which he created at the age of 19, reminds one so much of the paper-cuts he began to create fifty years later. In a small, very old booklet which the family found after his death, there are sketches he made as young boy; these were the seeds of his paper-cutting. Ya’akov was the president of the “Young Mizrachi” – a Zionist organization in his town Kluj. As a gifted designer he was chosen to design a post card for the first “Mizrachi” congress in Transylvania. This post card was sent by the movement to many places around the world as a fund raising campaign for the “Chalutitzim” – newcomers to Israel. In 1935, a week after his marriage to Fruma Beack, the young couple immigrated to Haifa. In Haifa he worked as commercial artist and sign painter. Taking care of a family and the hardships of life in Palestine at that time kept him away from creating art for the sake of art – something he loved so much. After his retirement in 1977, at the age of almost 70, Ya’akov took up the art of paper-cutting. His works centered on Judaic themes and symbols – biblical stories and verses, Jewish prayer and holidays, Pirkey Avot (Ethics of the Fathers), Jerusalem and other Jewish subjects and customs. During the next twelve years he created as many as 600 different paper cuts all relating to Jewish themes and tradition. Ya’akov was among a handful of artisans who worked to revive and restore this beautiful art form. He remembered the art from back home and knew that Jewish paper-cutting can be traced back to medieval times. He also understood that it nearly vanished during the Holocaust and his desire was to revive this beautiful craft. He understood the importance of exposing and passing the art to the new generation. Together with his daughter-in-law Zipora Ne’eman, he gave workshops in Israel and abroad. Ne’eman’s paper cuts have been displayed throughout Israel, the United States, Canada and Europe and his works acquired by museums and private collectors all over the world. Ya’akov Ne’eman passed away in Haifa in 1992, but he left a legacy of beauty and inspiration. His daughter-in-law, Zipora Ne’eman, is continuing the very important task of restoring and revitalizing the tradition of Jewish paper-cutting by keeping alive Ya’akov’s works and by her own creations and innovative teaching methods and workshops. The contribution of Ya’akov Ne’eman to the reviviscence of Jewish paper cutting is invaluable and his works treasured. “Ya’akov Ne’eman, master of the paper-cut, is at once a preserver of an ancient tradition and an innovator. Many of his paper-cuts, in which Ne’eman is so preserving and exacting, recall the traditional eighteen-nineteen century paper-cut of Eastern Europe. These are symmetrical in composition, with the Menorah, the Shofar, the Torah Crown, the Tablets of Law, paired lions, stags and birds – all within a dense interlace of branches, leaves and blossoms – forming the main motifs. The word Mizrah or a benediction of some sort is often incorporated in the symmetrical patterns, at times within a medallion. But even those paper-cuts which at first glance appear wholly traditional in character demonstrate Ne’eman’s originality of composition in his arrangements of objects and decorative elements and his highly original embellishments of traditional themes. Ne’eman’s major innovation lies in his combining traditional representations with symbols of national renaissance in Israel. The traditional Menorah, lionsandpries’s hands raised in blessing are combined with flags, next to the symbols of the twelve Tribes either encircled by or encircling the main motif. Numerous details of present day Jerusalem are also incorporated: domes and towers, synagogues, churches, minarets and even Montefiore’s windmill alongside the YMCA tower and the arches of the Chief Rabbinate building. Of most interest among the Hungarian-born Haifa artist’s innovations are biblical representations, including Noah’s Ark, the binding of Isaac, Jacob’s dream and Jonah in the Whale. These imaginative contour drawings, innovative as they may be, nonetheless continue another tradition of the highly expressive, Eastern European folk art in the last centuries. The technique of producing paper-cut with the aid of a sharp blade or fine scissors was known in various locations at different periods, and developed both among oriental and occidental Jews. 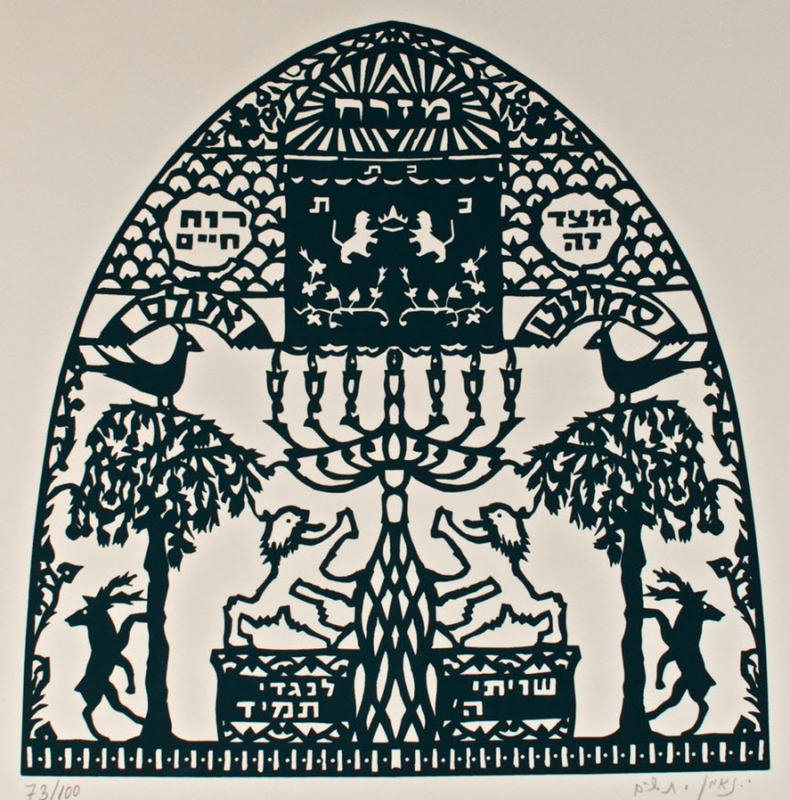 Jewish paper-cuts are unique in character by their strict symmetry and clear motifs – so authoritatively described by Dr. Giza Frankel in her The Art of Jewish Paper-cut (Masada, Tel Aviv, 1983). Ya’akov Ne’eman continues the Eastern European tradition, enriching it with the product of his own creative imagination. Today, so many years after Ya’akov passed away, his paper cuts are still being shown in exhibits around the world and are a great inspiration for the thousands of students that study paper-cutting with Zipora Ne’eman, Ya’akov’s daughter in law. If you would to inquire about Zimmerman Fine Art, please send us an email today!